For ten years, Biscuit has opened hearts to the intelligence and love of pigs. He opened minds to what pigs go through in the meat industry. He helped children learn confidence and gentleness simultaneously. He was a shoulder to cry on. He was a listening ear. He was a best friend and a gentleman. He was a great and powerful force and a forgiving, loving priest all at once. He has hundreds of thousands of fans all over the world. We first found Biscuit in a pumpkin patch exactly 10 years ago. We took our kids there to pick out pumpkins, having no idea there would be any animals there. But as we entered and walked around we discovered Biscuit in a tiny cage all alone. He looked so sad. So we spent most of the day feeding him and giving him tummy rubs through the bars of his cage. At the end of the day as we left I told the owner of the patch that we loved his piglet. He told us that the pig was on loan to him and that the day after Halloween he would be sent to slaughter. Horrified, my children and I went home and cried for several days. About a week later I was getting the kids dressed and fed before school in the morning. My husband, Jay came in and asked us all to come out to the barnyard. I told him we could do that later but right now I needed the kids to finish their breakfasts. Jay, however, insisted that we come out right away. So the whole family went out to our front yard in our pajamas, and there was Biscuit! Jay had saved him for us! We were all so happy and excited we could not stop jumping up and down for joy. Biscuit had never seen mud before and we all laughed until we cried as we watched him splash, and roll, and play in his pool for the very first time. From that minute he had won our hearts and we have been madly in love with him ever since. If you haven’t seen Biscuit’s very first day at The Gentle Barn, this video will put a smile on your face and joy in your heart! Biscuit had a twisted sense of humor. Each day when the barnyard was quiet and serene and everyone was digesting their breakfast, meditating, or taking their naps, Biscuit would tip toe into Zeus’ room while Zeus was snoring peacefully. Then Biscuit would bite Zeus on the behind, Zeus would wake up screaming and trying to stand up, and Biscuit would roar with laughter. He loved this game so much and would not stop no matter how much we scolded him, that we had to keep either Biscuit’s door or Zeus’ door closed at all times. We literally had to have volunteers in the barnyard all day long to rotate their doors and give them each turns to go outside. Even though Biscuit wasn’t all that gentle with Zeus, he was always a gentleman with our guests. He would roll over for tummy rubs with the slightest touch. He would hold still and act kindly with the smallest of hands and the youngest of children. And he would allow us all to cuddle with him. One of my fondest memories is laying in the stall with him, nestled in the straw, with a blanket and a book, on cold days, resting my head on his stomach and feeling so safe and warm. Biscuit was determined to live with us for a long time. He always ate his fruits and veggies, never over ate, and from the beginning he would wake up each morning at 6 AM and go jogging for an hour. He would race around the barnyard galloping so fast that the other residents had to scurry out of his way. Biscuit was determined to stay in shape and be strong and healthy. I woke up at the same time as Biscuit so I would always look out the window as I got dressed and watch him gallop around the barnyard, dust flying as he ran. All I have to do is close my eyes and I can still see him running, ears flopping, and mouth smiling a huge, full-of-life grin. 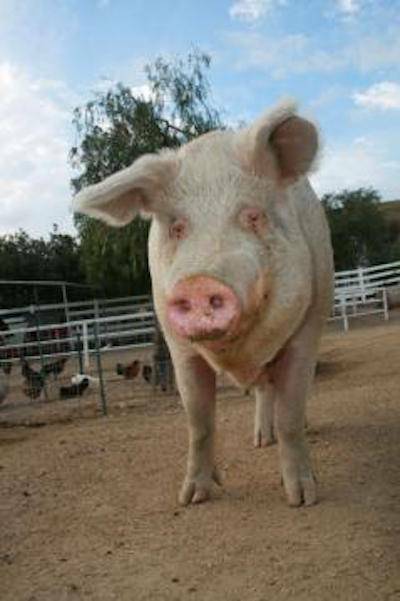 Farm pigs are genetically engineered to get very big, very fast, so they can be slaughtered at three to six months old. When we save them from slaughter, they grow until three months like they are supposed to, and end up 1,000 pounds, like Biscuit. Eventually, they are so abnormally enormous that they cannot walk and we have to help them out of their bodies. Because of his daily exercise routine and excellent diet, Biscuit made it nine years when mobility became a challenge. It was shortly after his ninth birthday that he fell in the barnyard one evening and could not get up. We finally succeeded to get him into his room, onto his soft straw bed, but I'll never forget the fear in his eyes. He looked terrified knowing that if he could not walk, he could not live. I stayed with him that night till one in the morning reassuring him that we would do everything we could think of to help him walk again. I promised him that we would not help him out of his body until he was ready, and that he could stay as long as he wanted. I promised him that we would never make him go and that we loved him. Over the last year and a half we have had our chiropractor come each and every week to adjust Biscuit. We had a holistic veterinarian prescribe eastern herbs to strengthen his muscles and hind end. We had a western vet prescribe anti-inflammatory medicine to help him stay pain free. We also had our staff and volunteers rub his belly and help him stand and walk around the barnyard each and every day by holding his tail to balance him. Many pigs have an even harder time walking because they are overweight, but we have always kept Biscuit on a restricted diet so he would stay thin and trim and be able to walk and live longer. All of those things combined gave us an extra year and a half with Biscuit. When you stretch a rubber band, it is only a matter of time until that rubber band snaps. Our rubber band snapped today. Biscuit had a harder and harder time standing. His muscles would tremble under his own weight. When he would walk around the barnyard he would sometimes fall. He spent so much time in bed that he starting developing bed sores. He no longer seemed happy. I sat down and meditated with him, getting still and quiet. I asked him how he was doing and what he wanted. He said that he misses running like the wind. That he was so frustrated that he can’t just stand up and walk around like before. And that he is ready to be free of his bulky, heavy, clumsy body. I asked him if he was sure, and he said absolutely. When the vet came the next day I talked to Biscuit again. I asked him if he felt the same way or if he had changed his mind. He said that he was ready to be free and at peace and that he was anxious for the vet to start already. I explained to him that the vet was going to give him a sedative first that would make him feel relaxed, sleepy, and pain free. Then the vet would give him another shot that would stop his heart and give him the ability to lift out of his body, but that he would not feel it. Every year he had the sedation shot so the vet could trim his hooves and tusks. Biscuit hated that shot and would often squeal and try to evade the doctor. Today Biscuit did not squirm or squeal and lay perfectly still for the doctor, seemingly excited for his shot. As Biscuit drifted off to sleep I put my arms around him, my face on his side, and held him, stroked him, and kissed him. Jay and I have loved so many over the years and have had to say goodbye to more than we can count. When we are helping them cross over I don’t pay attention to what the doctor is doing, but rather I close my eyes and connect to the spirit of the animal. I explain that they will feel tightness in their chest and an inability to breath, but to not be afraid. I suggest that they should just surrender and then lift out of their bodies. Sometimes the animal lingers in their body for a while. Sometimes the animal does not want to leave me, and I have to leave the room so they will leave their body. Sometimes the animal will leave their body but remain in the barnyard for several days. Sometimes they are so eager to leave to the next place that they shoot out of their bodies and fly, or run, or become like the wind. Biscuit kept talking about his frustration at not being able to run, so I expected to watch him gallop into the sunset. But instead, I felt him lift light as a feather out of his body and go towards a very bright light. The light opened wide as he entered and inside were hundreds of beings clapping for Biscuit and giving him a standing ovation. I bowed low as he stepped completely inside and the light enveloped him and closed behind him. It was then that I realized that we have all been in the presence of a great and powerful master. For ten years, Biscuit has opened hearts to the intelligence and love of pigs. He opened minds to what pigs go through in the meat industry. He helped children learn confidence and gentleness simultaneously. He was a shoulder to cry on. He was a listening ear. He was a best friend and a gentleman. He was a great and powerful force and a forgiving, loving priest all at once. He has hundreds of thousands of fans all over the world. He came to change the world, and he has indeed changed our world forever! I thought that today would be one of the saddest days of my life and the missing him would kill me. But seeing him go and be received with that standing ovation and realizing what a great master teacher he was, all I feel is grateful to have known him, honored to have loved him, and hopeful to be alive in a world made better by Biscuit!